Application Translation Server (ATS) is a standalone, automated conversion software product which plays an integral role in modernization of solutions. Application Translation Server (ATS) enables companies to migrate and consolidate legacy applications to newer, Internet-based applications on Oracle technologies. 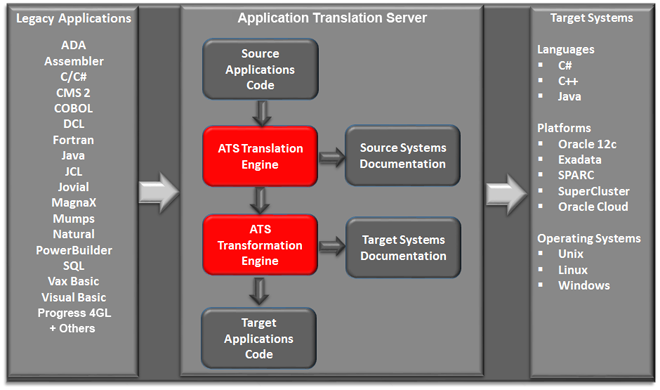 Application Translation Server (ATS) utilizes our software suite for application translation and transformation. Our software suite is a product with extensive capabilities to consolidate and eliminate redundant code, and auto, semi-auto and custom refactoring of code. Application Translation Server (ATS) will automatically document legacy applications with a detailed presentation of the structure and flow of the legacy code and automatically convert selected legacy applications to newer, web-based technologies. The maturity level of this product, for many of these languages, is quite high (80% – 90% automated conversion).